It's so interesting to me to be diving into Mexican culture and history as research for my trips to Mexico to produce more art. I really want to help enlighten and inform others about my Mexican roots. I didn't really pay attention in history class when I was younger, but now I can't get enough. And let's be honest, how much of American history do you remember from your school days? I'm the first to admit I didn't retain much. Mexico's Flag Day is approaching on Feb 24th, so I thought it would be a good idea to look into the flag's history and share with you. The first national flag of Mexico was created in 1821 following its independence from Spain. While there are a few other flags that were used during the War of Independence from Spain, the first official use of a flag with the green, white and red colors was used after they won the war. Green: The first in the three stripes signifies the Independence Movement and hope. White: The middle stripe is to acknowledge the purity of the Catholic Faith and Mexico's strong devotion to it. Red: The vertical bar to the right is a representation of the blood that was shed for Mexico by the revolutionaries for independence. The coat of arms: In the center of the white stripe is an eagle with a snake in its mouth. This is to recognize the Aztec heritage of Mexico. Aztec legend states that the gods advised the people to build a city on the spot in which they saw an eagle perched on a prickly pear tree eating a serpent. This spot is now known as Mexico City today. Here are some variations that the Mexican flag has gone through before the current design that we know today was established. The first National Flag is from The First Mexican Empire from 1821 - 1823. The crown on the eagle's head signifies the empire under Agustin de Iturbide. 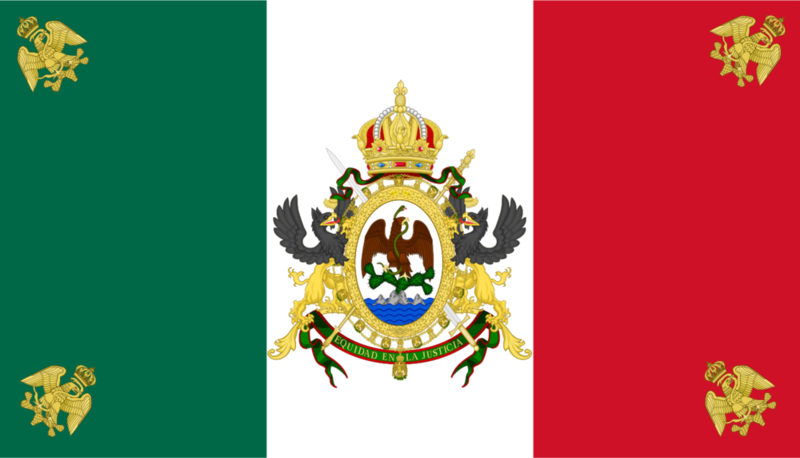 The second National Flag was used during the establishment of the Mexican Republic from 1823-1863, 1867-1968. You can see the crown was removed and the serpent, oak and laurel branches were added. The third National Flag was from the Second Mexican Empire from 1863-1867. The eagles in the corners were added to look like the French Imperial arms but with a "Mexican flavor"
Thanks for following along, feel free to leave a comment about something that was interesting to you. Or if you end up doing research on your own culture's flag, I'd love to learn something new so leave a comment below.